Gurnard really are quite an easy fish to catch. At the moment it seems that there are loads of them all around this area. They have become one of my favourite fish to eat, so I am pleased to see so many of them. Tactics are simple; a two hook flapper rig baited with small strips of Mackerel, Ragworm or Squid are all you need. You don’t need to cast far, as they can be caught as close in as 10 yds. Gurnard are not the only fish that seem prolific. Matty Mizen has once again been out catching more double figure Undulate Rays, as well as a decent sized Conger from Chesil. Last week I mentioned that I was going to be targeting Carp on the fly at the weekend. I am pleased to say that I was very successful with the technique. In fact so successful that I out fished all the guys with their bivvy’s and bite alarms. I didn’t land any monsters, but I had loads of Carp up to 10lb. 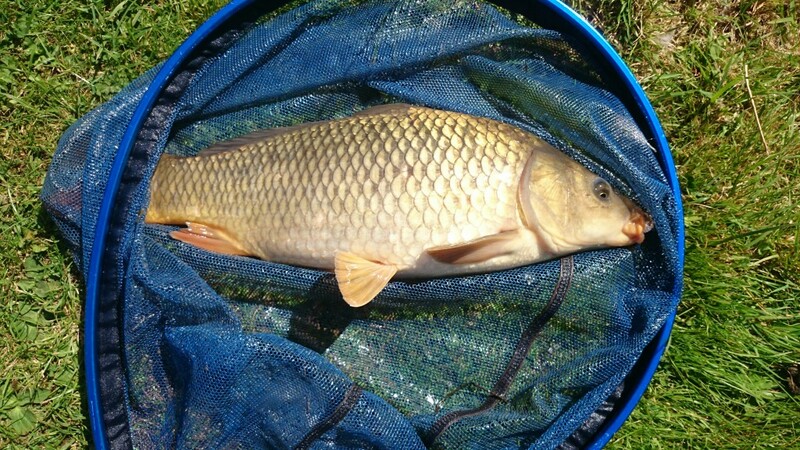 I also caught loads of Rudd and Roach on the fly. I will put up a dedicated article on what flies and gear I used. If you are impressed by that Carp, then wait until Thursday when you can read Darren Mills trip report from France. 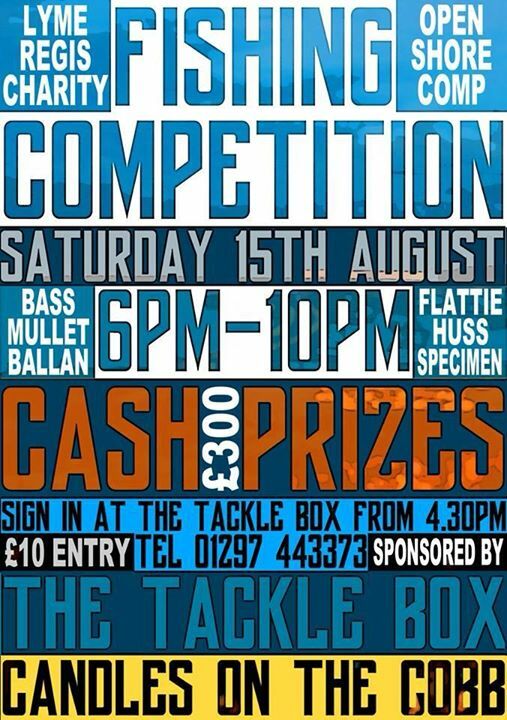 Chesil Beach forecast: Despite less than ideal conditions over the past few days, Chesil will continue to fish well. I ran the River Cottage Shoreline course at West Bexington yesterday. The water was coloured, but even so in just a few hours we managed 7 different species including Bass, Gurnard, Silver Eel, Flounder, Black Bream and Scad. One of the Scad we caught was only about 3 inches long. I suggested that it was used as live bait. It was cast out about 10yds where it quickly tempted the Bass in the picture below. As the water clears expect Mackerel and even more Gurnard, Rays and Bream. I would also expect to see Garfish feature more regularly. Take a quick look at my video on how to catch Garfish for a few tips. Portland: Once again, it will be a waiting game for the water to clear to target Wrasse and Pollock. I have heard of a few Bass coming to lures over the past few days. 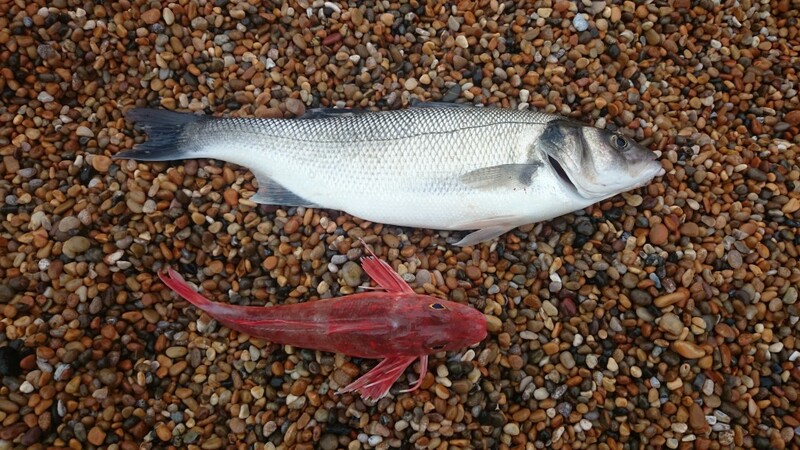 Portland Harbour: Small tides are never good for fishing in the harbour, especially for the Bass. However as the tides pick up later in the week the lure fishing should improve. 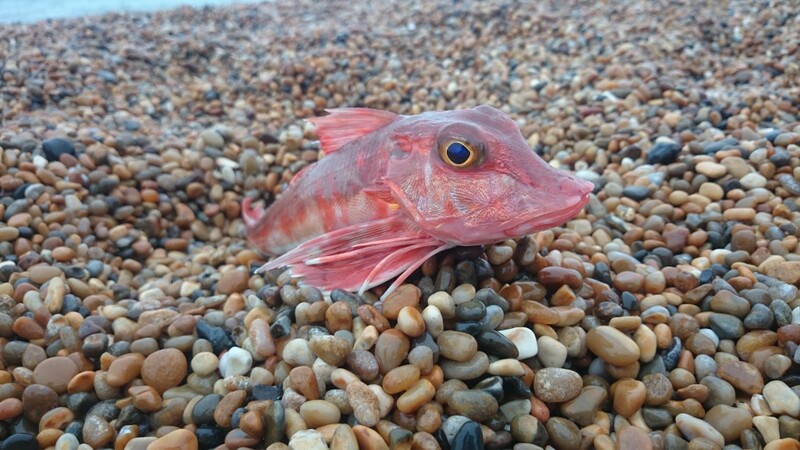 Weymouth Bay: Preston is one of the areas that is producing a lot of Gurnard and Dabs. Lots of Thin and Thick Lipped Mullet in the harbour. They are great fun if you put the effort in to catch them. A baited Mepps is ideal for the Thin Lipped Mullet. As usual the piers fish very well at this time of year. Simple tactics, such as just dropping a small 1/2 oz. lead and a single hook baited with Ragworm down the side of the pier will produce fish. 4 Responses to "Gurnard galore"
Not sure where you get your info. Today at West Bex 100+ anglers. Total catch approx 2 mackerel and 1 gurnard. I got my information first hand. I fished it with a party of 8 novices in less than ideal conditions on Monday. 7 species caught, including I find it almost impossible to believe that out of over 100 anglers that there was only 2 Mackerel and 1 Gurnard caught. As I mentioned in the forecast, the beach will fish for Mackerel when the water clears. It wasn’t clear on Tuesday, I wouldn’t have wasted anytime fishing for Mackerel in those conditions. It seems as if the Spider Crabs are ever present on Chesil now Tony. Dragons Teeth is a long way to walk for a Bream and a couple of Mackerel. I always think that Dragons Teeth is a far better winter venue, than a summer one. Head towards the Portland end for a wider variety of species.